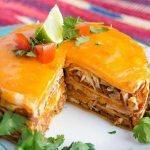 Instant Pot Chicken Taco Pie is a fun dish to make, and uses ingredients most of us have already. 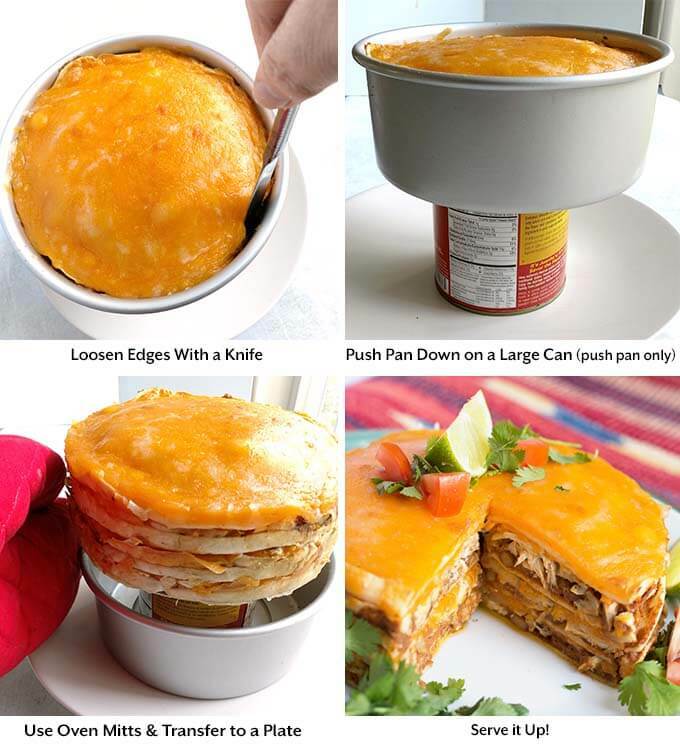 I like to make this pressure cooker Chicken Taco Pie using a rotisserie chicken, or leftover cooked chicken meat. It’s tasty and my family loves it! 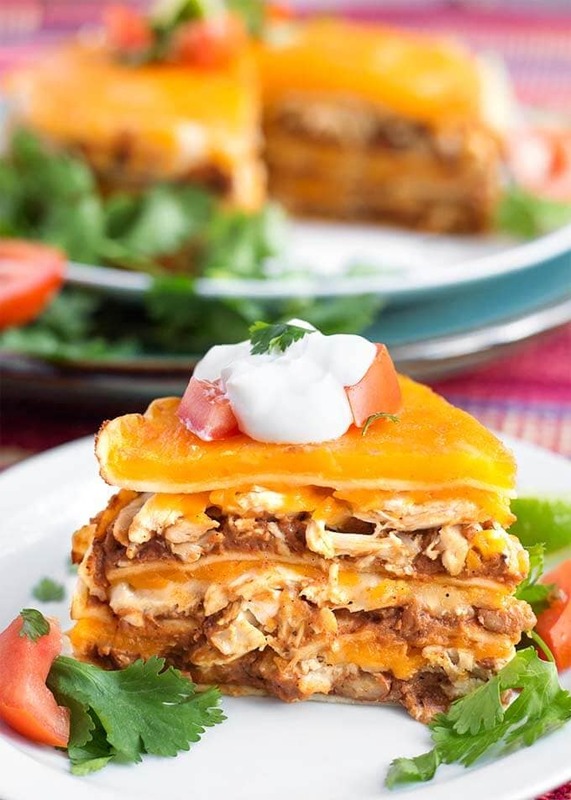 I love making layered casserole recipes. I have several that I have made in my trusty 13″x9″ baking dish for years. Not all of them will be as good when made in the pressure cooker. 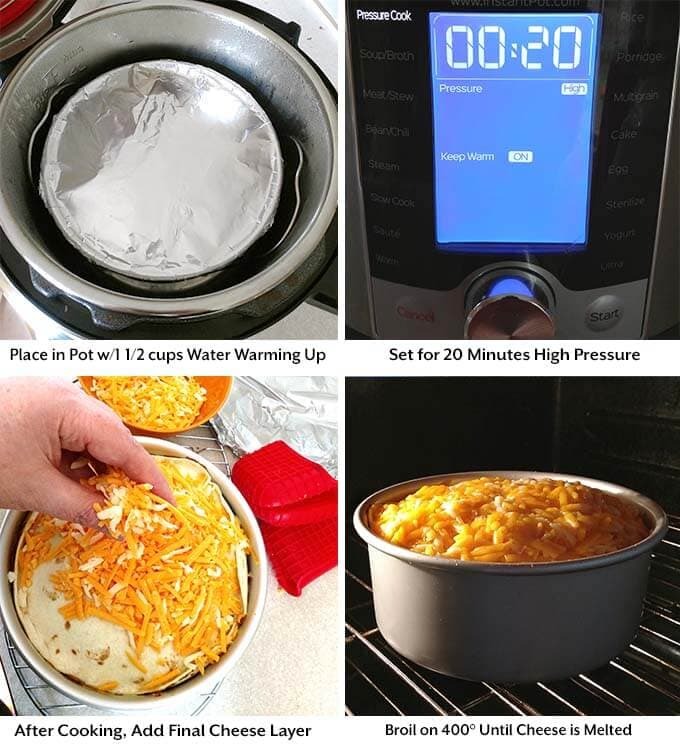 Instant Pot Chicken Taco Pie and Instant Pot Taco Pie (beef) work beautifully in the pressure cooker as they are covered during cooking, and they are cooked using the PIP (Pot in Pot) method. 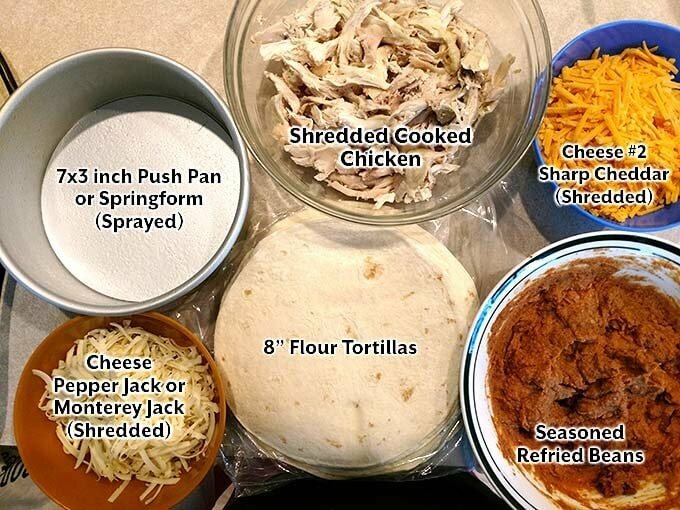 Here is a quick rundown of what you’ll need to make Instant Pot Chicken Taco Pie: 7″x3″ pan, 8″ flour tortillas, shredded chicken, shredded cheese, seasoned refried beans. 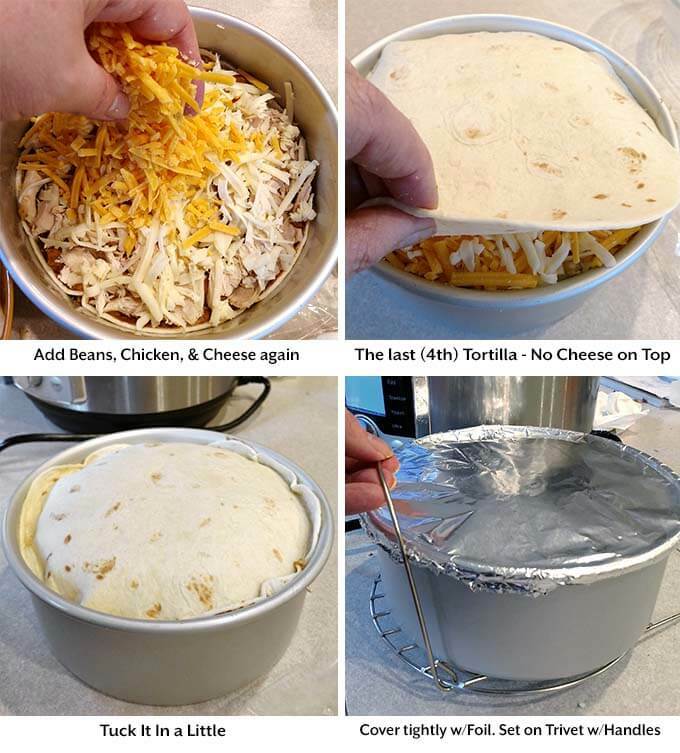 There will be 3 layers of beans/chicken/cheese, and 4 total tortillas to complete your Instant Pot Chicken Taco Pie. 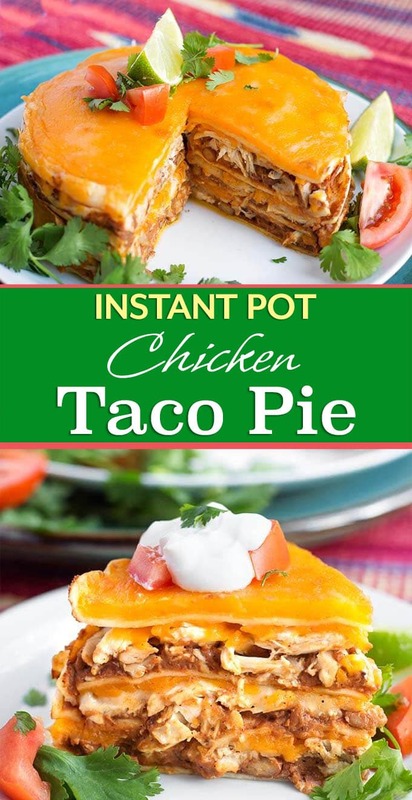 Instant Pot Chicken Taco Pie is a fun dish to make, and uses ingredients most of us have already. I like to make this using a rotisserie chicken, or leftover cooked chicken meat. It’s tasty and my family loves it! Gather and prepare everything you will need. 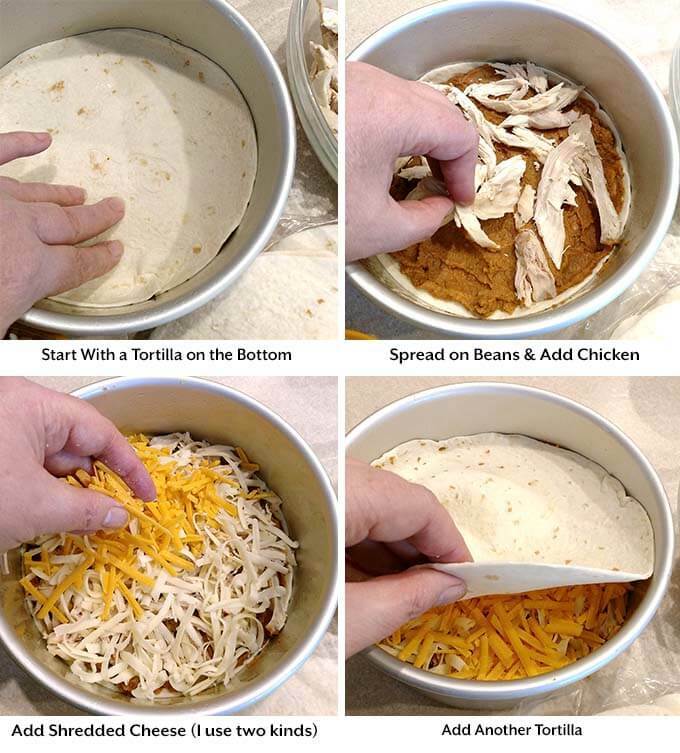 Prepare the rotisserie chicken, or other cooked chicken, shred the cheese, spray the pan with cooking spray.etc. Add the water to the pressure cooker's removable inner pot/liner. Set the pot to the Sauté setting. This will start the water heating up, which will bring the pot to pressure faster. Place a tortilla in the pan and press it down (it will be slightly bigger than the pan, and that's okay). Spread on 1/3 of the bean mixture, then 1/3 of the shredded chicken, and 1/3 of the cheese. Place another tortilla in the pan and press it down. Spread on 1/3 of the bean mixture, then 1/3 of the shredded chicken, and 1/3 of the cheese. Place a third tortilla in the pan and press it down. Spread on 1/3 of the bean mixture, then 1/3 of the shredded chicken, and 1/3 of the cheese. Place a fourth tortilla in the pan and press it down. Nothing goes on top of this layer yet. Wrap a piece of foil over the top and crimp it around the edges (you don't want the inside to get wet). Set the pan on the trivet and use the handles to carefully lower it into the pot. Cancel the Sauté setting. Place the lid on the pot and set the knob to the sealing position. 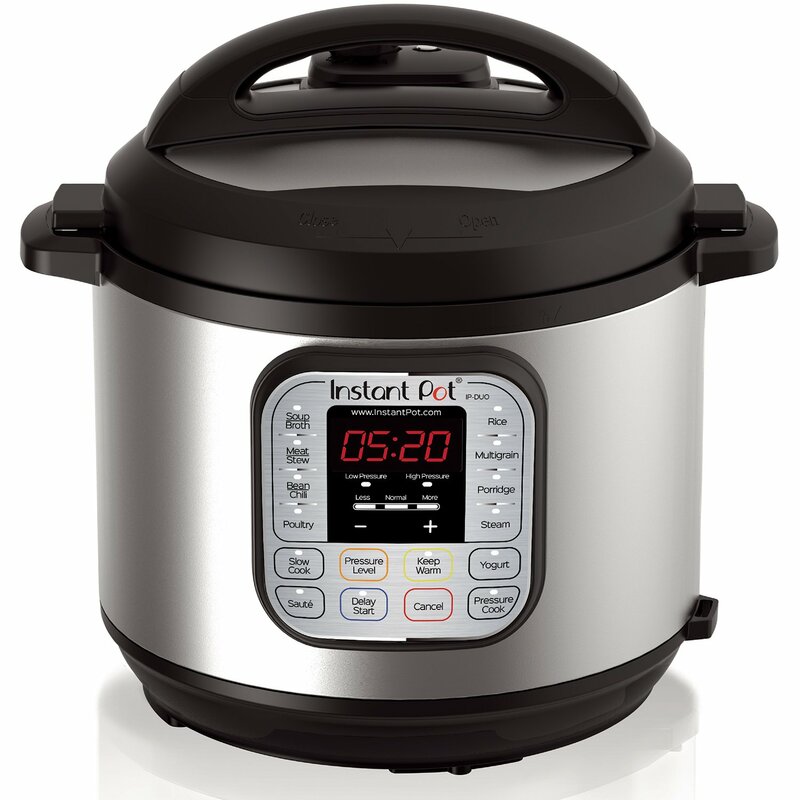 Press the Pressure Cook/Manual button, or dial, and then the + or - button or dial to select 20 minutes. 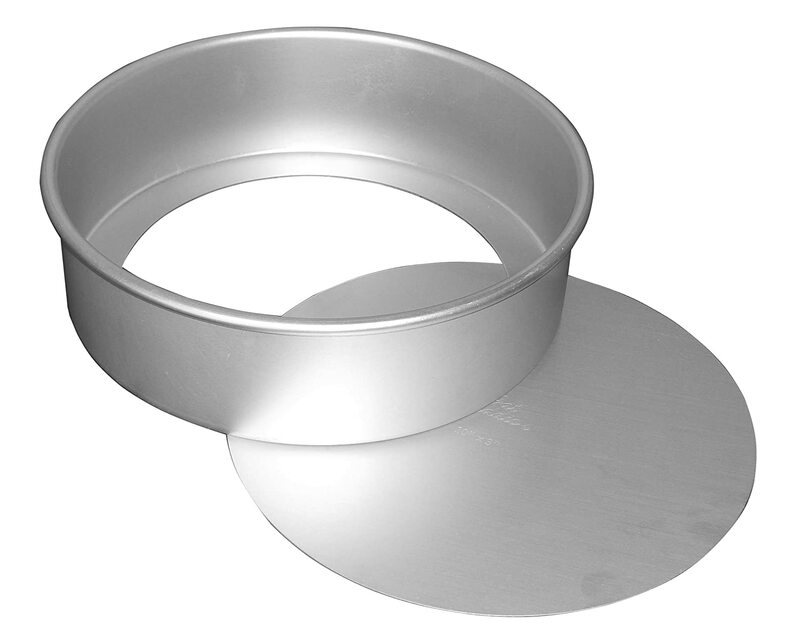 When the cook cycle ends, do a Quick Release of the pressure and when the pin in the lid drops down, open the lid and use silicone mitts to very carefully remove the trivet/pan. Carefully remove the foil and sprinkle on the remaining cheese. Turn on the broiler to 400° and set the pan under it and broil until the cheese melts. Let sit for just a few minutes to cool a bit and set up. Then remove from the pan and serve. Garnish with sour cream, avocado, salsa, cilantro, hot sauce, or whatever you like and serve! I was so excited that I had everything to make this! My son and husband thought I was crazy when I was making this! Then when they were eating it they both were shaking their heads up and down saying mmmmm. Mom knows best! Thanks for a great recipe, this one’s a keeper! Hi Kathleen! Wow, that was fast, I just posted this recipe today! Great timing! Well, I’d have to agree that mom knows best. I’m so glad you liked this recipe. Thank you for your review, I enjoy reading them, and they help others know if a recipe worked for someone else. I was so tired after work tonight and needed to find something quick. I had some Purdue precooked grilled chicken breasts…the kind in the 8 oz bags that are sliced up and I wanted to use them before the expiration date (1 being today). I had the other ingredients so this looked easiest and fastest. Score! The husband is picky and he’s on his second helping as I type this. Our 2 young adult boys are giving this a total thumbs up (and one is as picky as his dad). I liked that it was less saucy than similar recipes using ground beef and despite the cheese, it wasn’t greasy. I used vegetarian re-fried beans. I don’t know if I missed it…but I didn’t see anything about the chilis so I added them in the beans. This was good without the extra toppings but I did slice up avocado and it was great. Hi Dawn! I’m happy that your family enjoyed this recipe! Thank you for your review!